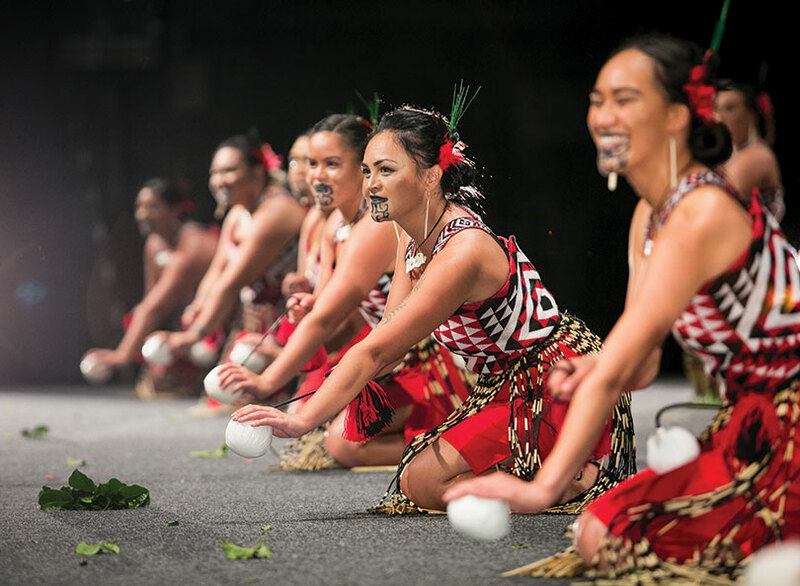 Te Matatini is the biggest event in the Māori calendar – a festival like no other that celebrates the fierce spirit of kapa haka with a national competition made up of teams from throughout Aotearoa. This year Te Matatini ki te Ao was held in Te Whanganui-a-Tara from 20–24 February, and one whānau was proud to see six siblings stand across three different rōpū to represent their collective passion for kapa haka. Nā RANUI ELLISON. 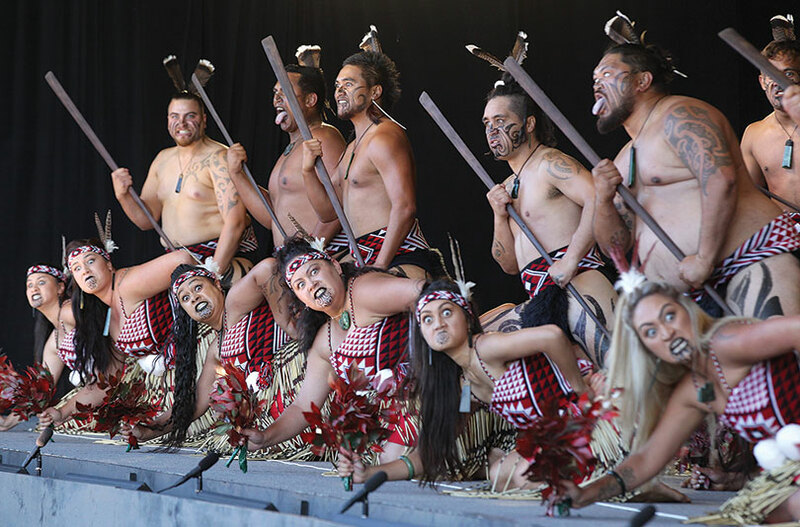 Above: Jay (rear left) and Kalani (front centre) performing at Te Matatini with Ngā Manu a Tāne. 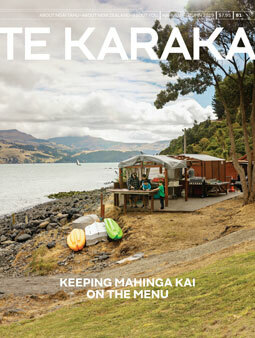 Since Te Matatini was first held in 1972 it has taken place every two years, hosted by iwi across six different rohe. This year, 46 teams took the stage to compete for the title of national champion at Wellington’s Westpac Stadium. To bring the sheer scale of this event into perspective, let’s do the maths: 46 teams, each with a maximum of 40 members, means that around 1,840 individuals stood and showcased the highest standard of Māori performing arts throughout New Zealand and Australia. Not to mention the tens of thousands of individuals – including myself – who attended in support of those participants in sunshine, wind, and rain. Jay is the elder brother to Leo, Kyall, Te Hane, Mahara, Anihera, and Kalani-James. This year at Te Matatini, six of the seven (and a couple of nephews and nieces) stood across three different rōpū representing both their Te Waipounamu and Te Ika-a-Māui whakapapa. I had the privilege of sitting down with a few of the whānau to talk about their collective passion for kapa haka that has continued for more than 25 years. Fittingly, we met at a local bar run by yet another of their whanauka – Lulu’s Bar & Eatery, which specialises in Māori infusion kai. Here I was introduced to Jay, Kalani, and niece Paris, who are part of Ngā Manu a Tāne, and Leo and his daughter Kaelyn, from Te Poutūmārō. They tell me that the haka life more or less began when Jay and Leo collaborated with other whānau in the south to stand for Te Kotahitanga at Te Matatini hosted in Ngāruawāhia. They drew inspiration from videos of their taua and pōua performing in 1981 with as much passion and accuracy as the contemporary teams. The younger siblings did not have the chance to gravitate towards Māori performing arts of their own accord, as once their older brothers started competing, they were placed in front of the TV to soak it all up. Whether this was merely for distraction purposes or more strategic reasons, it seems to have worked; because today, kapa haka truly is a family affair. Above: Leo Hepi (back row, second from right) performing with Te Poutūmārō. Since then, this whānau has watched the world of Te Matatini evolve into the multi-day festival we see today. They have observed countless rōpū come and go, and have seen the average age of performers get younger and younger. We are now surrounded by bright, talented, and confident rakatahi who are eager to take the stage and represent themselves, their whānau, their rōpū, and now their country – a fact that the Hepi whānau can attest to, with their nieces and nephews standing alongside them. In addition, rōpū throughout Aotearoa have continued to raise the bar, with the already high standard at the national competition steadily increasing. The Hepi whānau joke that this may or may not be a result of the gradual decline in the casual post-performance drink, and the growing promotion of haka fitness. The reality is that kapa haka is hard work. There is not only a large time commitment, but a substantial financial commitment; and that’s before adding composition, choreography, and group dynamics into the mix. “Gone are the days of haka into life – these days, it has to be life into haka,” observes Jay. And for each rōpū, this means something slightly different. Ngā Manu a Tāne was established in 2006 by former members of local rōpū Te Kotahitanga, and Whakapūmau, Whānau Tahi, Aranui, and Hillmorton students. Since then, the Ōtautahi-based rōpū has been developing its flavour as an urban group throughout the entire country. With an estimated one third of this rōpū being Kāi Tahu, their brackets tend to draw on this collective whakapapa – but also acknowledge the influence of other iwi and whakapapa connections amongst their members. Te Poutūmārō is a newer group established by a range of talented haka-minded people who wanted to bring the best of Aotearoa together. Their members are spread across the country, from Auckland, Nelson, Christchurch, Queenstown, and Invercargill. The geographical reach does present challenges, but in a digital age, the group has been able to embrace modern technology to make composition and practices possible. Kalani tells me that individual members would keep the rōpū up-to-date with their progress and ongoing commitment by recording themselves performing the bracket and uploading it to their communal Facebook page. Above: Mahara Hepi (second from right) performing with Te Pou o Mangatāwhiri at the Waikato Regional Kapa Haka Competition 2018. The Hepi sisters, Mahara, and Anihera, are based in Waikato and are part of Te Pou o Mangatāwhiri. Mahara in particular has been a member for many years, and has stood with the rōpū at two successive Te Matatini festivals. This kapa was formed by Princess Te Puea Herangi in the 1920s, and has rich historical ties to the Kīngitanga. Today a fierce competitor at Te Matatini, the rōpū was originally created to travel around the North Island performing and raising funds to build the Māhinārangi whare. It is worth mentioning that for all rōpū, there is, as Jay puts it, “a bigger kaupapa than just performing.” Education and te ao Māori go hand-in-hand, and kapa haka is the perfect medium to tell our stories, use our mita, and showcase our talent. Te Matatini gives qualifying rōpū the opportunity to share this on the national stage – within the 20 minute time limit, of course! Despite being in separate rōpū, the Hepi whānau remain supportive of one another, frequently expressing their pride in the success each sibling has had on stage. In the short time I spent with these haka-minded individuals, I was impressed by the strength of their shared passion and the way it has bound them together. I would like to mihi to all those who took the stage at Te Matatini, and those who attended in support of their whanauka in what was yet another successful festival. I can attest to the ever-increasing standard of Māori performing arts that graced and shook the stage.